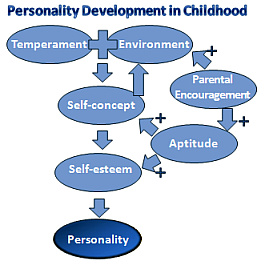 Personality development is outcome of cognitive, emotional, motivational and temperamental attributes that determine child’s view about himself, his world and the future. This is influenced a great deal by the type of attachment children form with their primary caregiver during the pre-school years. Constitutionally determined temperament has direct effect on pattern of child behavior and evolution of personality during childhood. Depending on individual temperament children elicit different stimuli from the same environment. For example; a child with inherent "dependent nature" will find concerned parents and teachers comforting, whereas a child with high levels of energy and inherent low capability to adjust will find them intrusive and restrictive. Environmental events during childhood influence children's behavior and personality formation, which in turn influence the environment. Same environment imparts different childhood experiences to children with different behavior traits. Furthermore, the environmental factors along with child’s inherent temperament have a direct effect on child’s “self-concept”, the crucial component of child’s personality development. Child’s environment is greatly influenced by child’s concept about himself. During tween and the initial years of teenage development, children interpret their self concept from how they are known by their peers. So, for them to risk peer rejection is not simply to endure a bout of loneliness, but that of loosing their identity. Parents’ encouragement and support build up child’s self-concept and parenting is a single factor which is in our control. Positive parenting can favorably influence children's aptitude and environment which attribute to their self-concept and self-esteem. Understanding children’s temperament and providing continuous support can help them through the turmoils of teens and peer rags. The confidence children have that at home they are trusted and accepted for what they are helps them acquire a strong foundation for healthy personality development. Click here for self-concept contributing factors, myths and solutions. A child who feels good about himself is satisfied with himself and with the world around him. He develops the “I am OK, You are OK” view towards the people in his environment. A good self-concept minimizes the conflicts that come up on the path of children's psychosocial development . Birth order also contributes to child's self-concept and has a profound effect on personality development. Change in the family structure or situation influences the role and patterns of interaction, such as birth of a sibling, separation or divorce of parents, death of a grandparent or loss of a parent’s job. In English language there are thousands of words to describe the personality of an individual. They are also called personality traits. It is the personality trait that determines how a child adjusts and reacts to to various environmental situations. Cardinal traits dominate a child’s whole life, often to the point that the person becomes known specifically for these traits. Effects of cardinal traits on the personality development tend to develop later in life and are not usually seen during childhood. 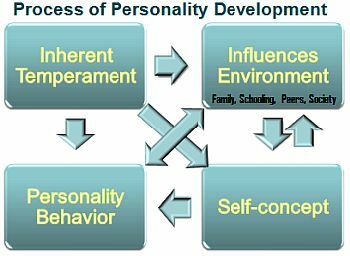 Central traits are the general characteristics that form the basic foundations of personality development. Secondary traits are often related to attitudes or preferences and often appear only in certain situations or under specific circumstances. Some examples would be getting anxious before travelling or impatient while waiting in a queue. 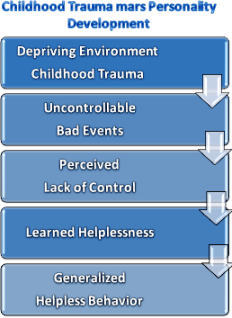 Childhood trauma leaves a lasting effect on child’s psycho-social, cognitive and language development. Children commonly experience trauma due to strict disciplining by disturbed parents. The above events seriously disrupt a child’s sense of safety, which results in unresolved childhood trauma carried over into adulthood. They regard the world as a frightening dangerous place; may it be a single traumatic event or repeated trauma. Their personality development gets masked by the sense of fear and helplessness and often become victims of repeated traumatic experiences. Their emotions and psychology is severely bruised. Children accomplish the developmental tasks related to psychological maturation only in a healthy adult-child relationship. Inadequate child parenting due to any cause hampers personality development. For related pages, please scroll through the right column. Need more specific information? Post your questions.